Stack Emission monitoring is often referred to the air monitoring of an emission point. Typically, such monitoring is carried out on boiler stacks, exhausts from printers, discharges from bag filters, thermal oxidisers and is performed on a regular basis. Stacks from boilers and industrial processes will carry pollutants such as SOx, NOx, particles, solvents and other dusts and gases. These can have a detrimental effect on local air quality and for this reason such emissions are often regulated. Typically this regulation requires measurement of the concentration of these pollutants on a regular basis, often referred to as periodic stack emission monitoring. The regular will usually set limits as to concentration (or mass flow) and purpose of the monitoring will be to determine whether the emissions are below the limits. 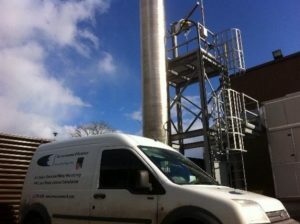 Environmental Efficiency is able to carry out stack emission monitoring of all types of stacks for all industries across the UK and Ireland. For large sites regulated by IPC, IED or Waste Licences the requirement is that the monitoring organisation be accredited to ISO17025. Our technical team is also able to offer this stack testing service. For smaller sites not regulated by IPC, IED or Waste Licences, there is no requirement for ISO17025 accreditation. This means that Environmental Efficiency is able to offer a lower cost service that is fully compliant with the needs of smaller sites. This would include Part C PPC installations in the UK, and local authority permitted sites in Ireland. Despite this lower cost, the methods used will be ISO, EN or BS methods and the staff MCERTS accredited. What if stack emission limits are exceeded? Where emission levels exceed limits set in licences or permits this would be considered a non-conformance and the regulator would be keen to ensure that the matter is dealt with appropriately. One option is to carry out that air dispersion modeling to ensure there is no detrimental effect on local air quality (sometimes referred to as ambient air quality). Environmental Efficiency is able to carry out air dispersion modeling using AERMOD and other software. Alternatively, abatement can be proposed such as bag filters, cyclones, scrubbers or thermal oxidisers depending on the nature of the pollutant. In Ireland the EPA document AG1 specifies the size and location of stack emission monitoring ports and sampling platforms and AG2 specifies the emission monitoring and analysis methods. These standards are mandatory for reporting results to the EPA. For non EPA licensed sites monitoring personnel are free to use whatever method is appropriate and cost effective for the particular site. In the UK the equivalent guidance is the Environmental Agency’s M1 and M2 documents.